It is always interesting to check out tinkerspaces of our makers. On Wednesday, part of the Singapore Mini Maker Faire team made a trip to “L’Observatorie in Singapore”, an art and science space set up by Isabelle Desjeux for learning and sharing. Isabelle is not new to the team as she took part in the first Singapore Mini Maker Faire two years ago and conducted a portable handphone microscope workshop. Her tinkerspace is tucked in a quaint corner at Turf Club Road and is located within a kindergarten building (The Blue House International School). A perfect setting to inspire tinkerers and makers. What awaited us was a painting session as part of “Colour Me”, an investigative and participative project by Richard Kearns, L’Observatoire’s Artist-in-Residence from January till March. Richard showed us a huge etch press which is used for printmaking. He also explained how the prints were solar etched onto photopolymer plates and demonstrated how the printing was done. It was fun to try our hands on the painting which was limited by the 4 colours available for each print, and it was exciting to see a traditional etch press at work. It has certainly inspired me to start exploring printmaking using a press! L’Observatoire has a lot of interesting gadgets, such as pinhole cameras, DIY weaving loom and its own darkroom! Check out some of these photos! Inspired to make something like that for yourself? Reminded me of my own exact letter stamp set! If you are interested in the “Colour Me” project by Richard Kearns, check out the event details at the “Colour Me” Facebook Page. The sessions he is conducting at L’Observatoire will end this Sunday (30 Mar). 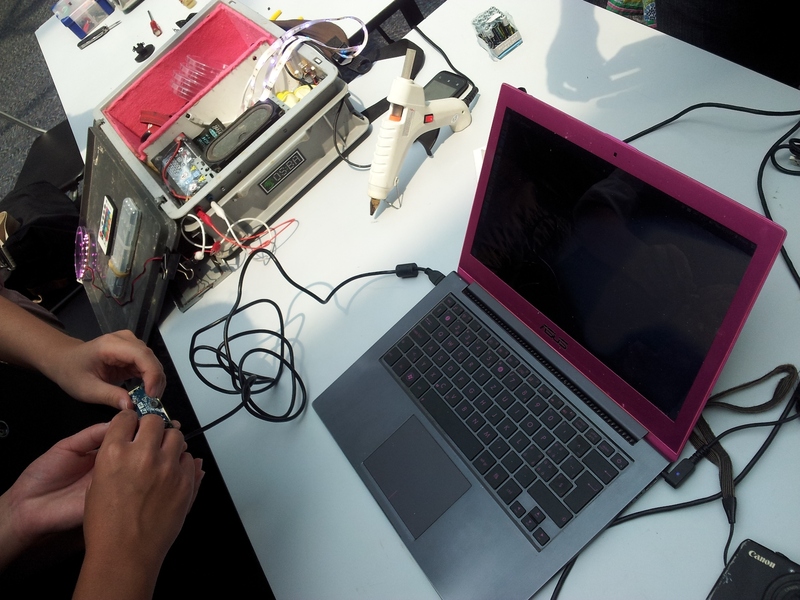 Look out for future projects that Isabelle and Richard would be embarking soon for the Singapore Mini Maker Faire 2014!